Biodegradable and flushable with refreshing, soothing organics: Aloe Vera, Calendula, Chamomile, and Ginseng. An Emerita women's wellness product. Fresh. Clean. Healthy. Confident. That's how you can feel every day. Experience a cleansing cloth that's formulated to help promote overall vaginal health. 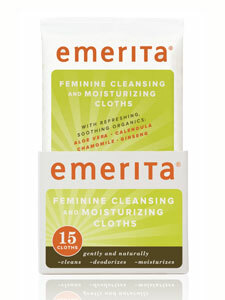 From Emerita, the leader in natural personal care and wellness products for women. Suggested use: Gently cleanse from front to back. Discard after use. May be used daily. What's in it: Refreshing, soothing organics including Aloe Vera, Calendula, Chamomile, and Ginseng. What's not in it: No parabens, mineral oil, petroleum or animal anything. And our products are never tested on animals. Ingredients: Water, Laurus Nobilis Flower/Lead/Stem Water, Sorbitol, Gluconolactone, Calendula Officinalis (Calendula) Flower Extract, Chamomilla Recutita (Matricaria) Flower Extract, Oryza Sativa (Rice) Extract, Pana Ginseng Root Extract, Aloe Barbadensis (Aloe Vera) Leaf Juice, Cellulose Gum, Sodium Benzoate, Phytic Acid, Xylitol, Tocopheryl Acetate, Squalane, Retinyl Palmitate, Sodium Hydroxide. *Certified Organic Ingredient As with any product, if you experience irritation or discomfort, discontinue use and consult a licensed health care practitioner.